Nowhere Safe 3 is the third installment to the Nowhere Safe series by Red Panda Studios. + I liked the animations! Hahaha. 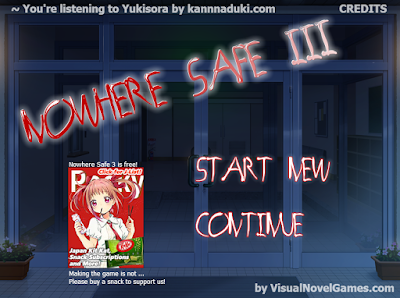 - The first Nowhere Safe game that I actually like, and it's so SHORT. In this third installment, we get a new protagonist (hooray!) named Momoko, a woman who seems to be in charge of a training gym after her father died and left everything to her. From the get-go, she seems to be quite incompetent, and not to mention, pretty childish, too. I guess, if there's one obvious thing that connects these games to each other, it's that the main characters have attitude problems. Yeah, attitude problems. There's this young boy, Matsu, who always seems to show up at the most unfortunate time and place. The curious thing is, though, for such a naughty boy, it seems like it's only Momoko that he bothers. The other employees of the gym are tolerant of the boy, though they are starting to get tired of Momoko's incompetence. The game is quite short, so it's easy to finish it. The good thing is, because of its short length, it doesn't have as much ridiculous subplots as the first two Nowhere Safe games. This is actually a good thing, as the relatively short story keeps me curious all throughout the whole game. Plus, I have to say that the ending tied the events of the whole game pretty well. One good point here, is that unlike in the first two installments in the series, the characters here are actually not insufferable at all. 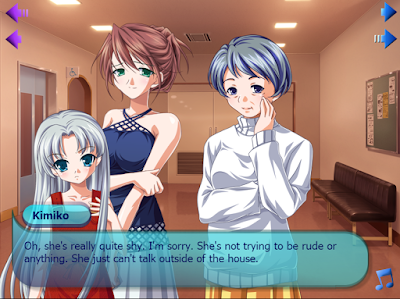 I even like the assistant, Hana, and Hide, a friend of Momoko. The only character I don't like that much is Chieko, Momoko's older sister, because she can be quite a snoop and she likes to meddle around, but still, she's a pretty realistic character, serving the role of an overbearing older sister. 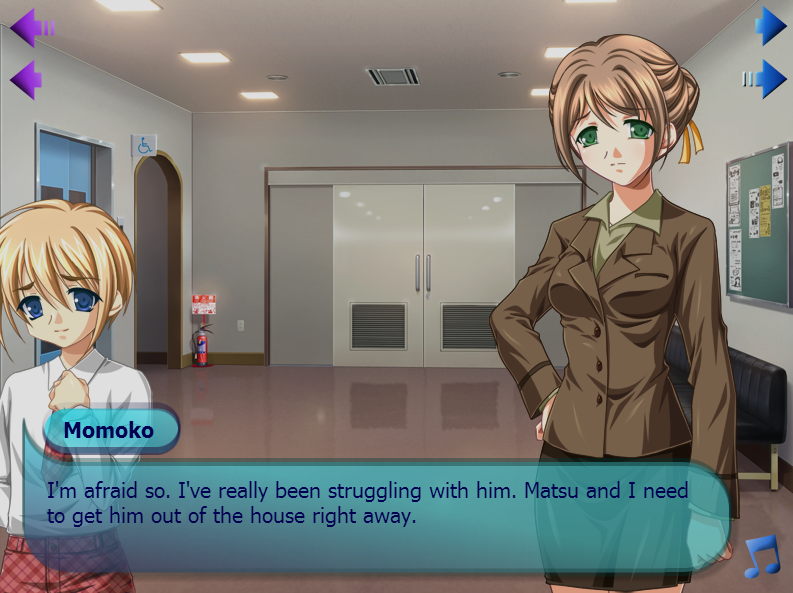 But I can see that she's really concerned about Momoko, so all's good. I actually liked the ending a lot, hahaha, even though I had already guessed the plot twist. (I'm an avid reader or r/nosleep, and this kind of plot twist is pretty common there) Plus, I think it was more of an info-dump than anything else, since all of a sudden, everything was explained in one conversation. Still, I liked how there's a plot twist regarding the plot twist. Hahaha. =) I still don't know what the truth is, exactly, but it's much better than the events from the first two games. Presentation-wise, the game is alright. The GUI (...if you can call it that) is much better than the ones in the first two games. The animations are also a lot better now, and I actually like the way Matsu pops up from under the screen. (Yeaaah, I get really happy at little things, lol.) The art... well, the game has different characters now, but the art style is still the same as before. Ah! Speaking of art, this is the first time we see Kimiko's face... and outside of her house. I'm guessing this is some alternate universe or something. Hahaha. As for the technical side, the writing is okay, just a few typos here and there (e.g. know instead of now), but nothing too major. There was a problem with the labeling of names, though, because sometimes, the dialog doesn't make sense and you'll realize that it's actually supposed to be said by the other character, only the name box is showing a different name. But that's about it. And I have to say, the soundtrack is nice! 7/10 strawberries. You can check it out here. :) Actually, you don't need to play the first two to get this one, as it's pretty much stand-alone.